LIGHTWEIGHT DESIGN, HEAVYWEIGHT PERFORMANCE OUT-LIFT, OUT-PERFORM, OUT-LAST. 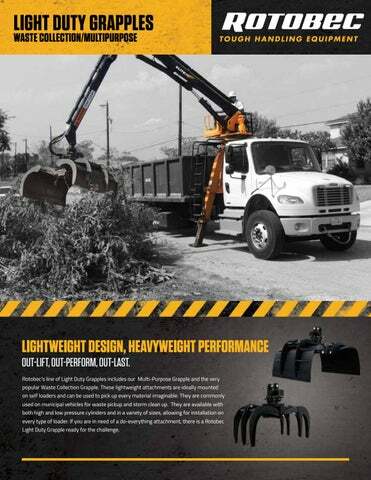 Rotobecâ&#x20AC;&#x2122;s line of Light Duty Grapples includes our Multi-Purpose Grapple and the very popular Waste Collection Grapple. These lightweight attachments are ideally mounted on self loaders and can be used to pick up every material imaginable. They are commonly used on municipal vehicles for waste pickup and storm clean up. They are available with both high and low pressure cylinders and in a variety of sizes, allowing for installation on every type of loader. If you are in need of a do-everything attachment, there is a Rotobec Light Duty Grapple ready for the challenge. The Waste Collection Grapple features an EXTRA WIDE JAW allowing for easy collection of scattered materials on the ground in a single motion. Our Multi-Purpose model has BYPASSING JAWS, allowing you to pick up a large variety of shapes and sizes with one attachment. OUT-PERFORM Both models offer CONTINUOUS 3600 ROTATION of the grapple meaning that you can clear large areas without needing to reposition your loader. Our Light Duty Grapples feature both HIGH PRESSURE and LOW PRESSURE options and the cylinders are manufactured with a BOLT-ON-HEAD design which results in unbelievably simple maintenance.